Nobody disputes that Macs are amazing. They can do it all — everyday office work, editing videos, writing blogs, chatting with friends. They’re beautiful, well-made and have great support. But have you wondered if there’s something beyond them? Something that gets everything you need (which is in web pages) done, but without the sticker price? Something that still looks cool, maybe even cooler for being unusual? Something that is a little counter-cultural, the way Apple used to be before they became (deservedly) mainstream? No, not Windows! I mean Chromebooks. After deciding to quit my last corporate job (where I had a brand new Macbook Pro), I knew I’d need a new personal machine. I thought of getting another Mac, but I thought: is there a better way? Can I get something cheaper, non-mainstream and possibly, in some ways, better? The answer: yes. And it’s a Google Pixelbook. About me (to see if you relate): I’m technical but not an engineer (I can hack my way through web pages, but slowly and with a lot of Googling). I edit raw photos, and do as much of terrible design in possible with apps like Preview on MacOS (and lamented not having MS Paintbrush for years). I live in Google Docs, not MS Office anymore. And I’m a heavy chat user — I used to use iMessage a lot (nowadays I use WhatsApp and Signal). Most importantly, I like trying new things. I’m writing this here to help you make the decision yourself. Brief summary: YES, You can do it. And it’s not hard. Unless you desperately need one full desktop app. 75% easy and transparent. Most of what I do (and what most people do) is in a browser. That’s the same. In fact, if you use Chrome… you’ll barely notice. The passwords and history just import over. 10% learning just the way a new OS does things, like the control panel and keyboard shortcuts. It’s an inconvenience that passes after a month or so. If you think back, maybe you did this switch before (like from Windows to Mac or vice versa). 10% cool new things you’ll love. Like easy printer setup. Barely ever having to reboot for major system updates (or if you do, it taking only 10 seconds). Touch screen. Other things. 5% annoying and for some, huge deal-breakers. Things that are about the same (let’s not forget these). Overall: YES, You can do it. Why I did this: To break free of the trapped feeling I had in the Apple ecosystem and the product release cycle. To feel different again. Also, Apple products feel like work lately. Whether you can do it: Yes, and your life will be pretty much the same afterwards. Maybe even better. Deal-breakers: Heavy video editing, analytics work or if you make Mac OS X apps. Basically if there’s an application like Adobe Premiere or R Studio you need for your day to day work, you shouldn’t do this. I’ll order this from most important to least important. Chromebooks have seamless integration with Google services. Core Google apps on my computer (Gmail in a browser, Google Calendar) are now THE ones that the device opens when I click on a link. No more accidentally opening Apple Mail and then having to shut it down. Go away, Apple Mail! Data syncs perfectly. In the past, I’d update a contact on one device, and not know when the contact would be updated on another device (not immediate. Overnight?). Tried Googling this a lot, signing in and out of devices, finding .plist files and deleting them, etc. Never consistent results. Chromebooks can run Android (i.e. mobile) apps. This is so cool! I have Instagram on my computer, finally! I can type a meaningful post on it easily. It’s also cool to use other tablet apps, like Hulu, Netflix etc. Might be similar/same as a browser, but it feels better. I used to have an iPad. ChromeOS (the Chromebook Operating System) is easier to set up and configure the first time. I’m used to a long walkthrough and set-up time, downloading apps and setting them up, importing all my data and folders from the old hardware. Typing in all my passwords again. Adding various accounts. Similarly, every time I have to configure a minor setting (like, changing trackpad scrolling from ‘traditional’ to ‘Australian’). I’m actually looking forwards to switching Chromebooks every six to twelve months to try something new and having the transition being almost instant. Once upon a time, this was an advantage Apple computers held over Windows ones. I don’t know how Windows is doing lately (I tried one for a couple of weeks but hated the lack of mobile apps). 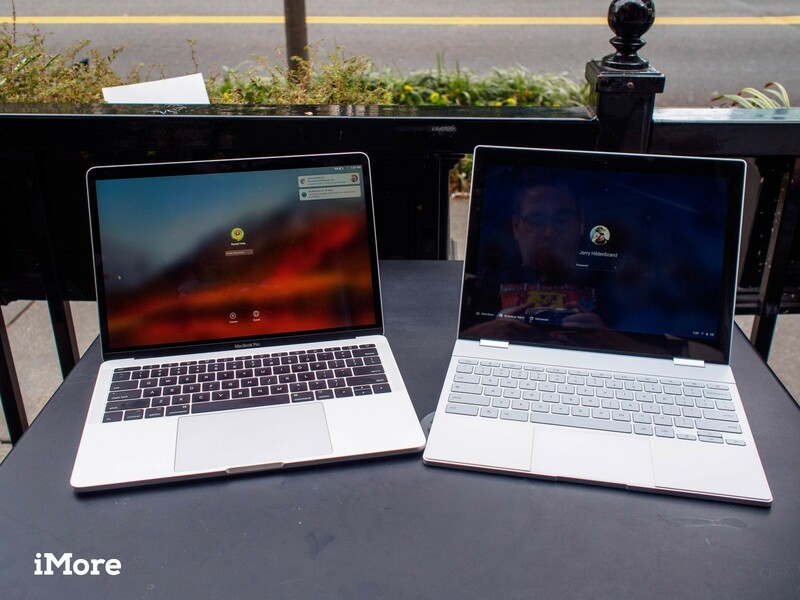 Now, it’s Chromebooks vs Apple. 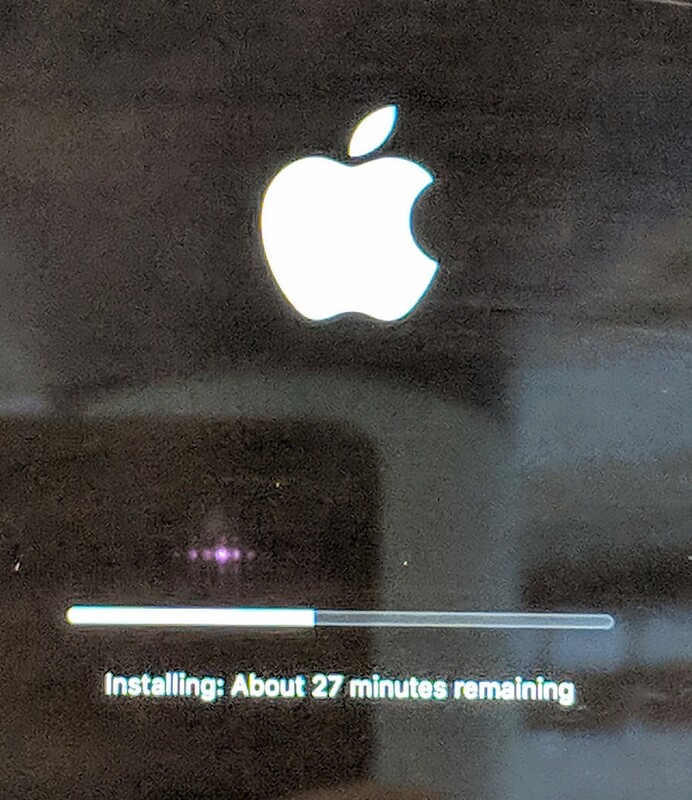 Every month or two there’s a major update that takes 30+ minutes. It’s infrequent, but there’s no good time for a software update. I know it’s annoying because I always put it off until another time (No, not now! Not in an hour! What, a day later is the maximum??). Chromebooks do have updates, but they happen in something like a minute or less. Not often, but never welcome. Is there a workaround? Why do we even need a workaround though? The Pixelbook has better ergonomics and usability. Keyboard. This is specific to this Chromebook, the Pixelbook. The Pixelbook’s keyboard is good. It’s as good as any good keyboard on a Dell or Lenovo laptop, or the ones Mac’s USED to have before going to the new ‘butterfly’ type on most modern models (2017+). Battery life is long. I go about one-two hours more on my Pixelbook than my Macbook Pro on a single charge (something like 8 hours). I had a top spec Macbook Pro, and have a top spec (i7, 16GB) Pixelbook. Touchscreen! Often I forget it’s there, but sometimes I forget it’s not not there and touch something. Unlike on my Mac, the screen actually responds. There are some things that are intuitive on a touch screen, like selecting individual files and photos. It’s thin and light. Roughly the same portability as a Macbook (the new, 12 inch kind). Plus, it folds up neatly and looks elegant. The Apple computers have great resale value. This is a ‘time will tell’ thing for Google Pixelbooks (which are well-made and have a decent chance at preserving value), but I have resold enough Apple computers to know they lose value very slowly. I sold a 2012 high spec Macbook Pro, purchased for $3,800 all-inclusive, for $900 in 2018. I sold my girlfriend’s 2016 Macbook Air, $1200 all inclusive, for $600 in 2018. I’ve had other previous similar results. Apple stuff will stay in fashion for a while. That said — I had to replace the motherboard and hard drive for the Macbook Pro, both $1000+ replacements. It was actually still working fine in 2018, but I knew that if something failed again I’d just have to replace it, and it was ‘time’. Not sure how much I’ll be able to sell the PixelBook for. If I had bought it new, I’d have paid $1,700. I bought it or $1,100 on eBay. I can probably sell it for $500 in a year or two. Generally with Macbooks I’ve lost about $500 a year (with machines ranging from $1,200 to 4,000 in value), so I’m fine with that. For cheaper Chromebooks, say one of the crowd favorites like the Asus C302CA, you will spend about $450 and maybe sell it for $100. You won’t lose much of the initial limited spend. Apple Support is SO much better than anybody else’s. Firstly, there are lots of options for support for Apple computers — online or many Apple stores. Secondly, they try to delight you. Even when you’re out of warranty/AppleCare, they still have a tendency to do things for free or low cost. I just keep hearing stories about people essentially getting an old laptop refurbished for free because one bit went wrong. Meanwhile, I had a problem with my Pixelbook (battery seemed to be draining fast… turned out to be Hangouts). I called Google, and the nice gentleman gave me some ideas, but told me he can’t replace it because I bought it on eBay second hand. It just met expectations in a way that Apple has conditioned me to expect them to be surpassed. It’s plenty fast. I can have 3 browser instances and 50+ tabs open (I should have less, but I only cut them down now to cut down distractions, not out of obligation to speed things up). At work, I’m also using an 8GB i5 Chromebook and that’s ALSO fast enough for everything I do at work. Lately I’ve been adopting a trend of opening fewer tabs, to focus better. I could have gotten a cheaper, less powerful Chromebook and not noticed! The colours are great and the screen is sharp. There is no noticeable difference between the Pixelbook display and any other high-end laptop like a Mac or a Dell. It’s smaller than my 15 inch Macbook Pro’s display, though, and I miss that. For what it’s worth, apparently the Samsung Chromebook Pro has the same display, and is much cheaper at $599 MSRP (and on Amazon for less). I need to throw up a terminal and modify stuff sometimes. Usually it’s using ssh to connect to a remote server, sometimes using vim over a remote connection to modify code. Once I got used to the new SSH Chrome app, there was no difference. There is one major difference here though and that’s that I can’t modify files on my OWN computer’s file system through a terminal (like batch renaming files for example). I so rarely do this though that I doubt many would notice. Between edits of this document, I had alredy forgotten. I use two monitors — I needed a special cable, though, to connect one USB-C port to two DVI-D monitors. Bluetooth devices, printing, WiFi etc. all work fine and setup was painless. What’s not great about the Chromebook/Pixelbook. It was hard to transition, but luckily you only have to do this once. Killing all my subscriptions in iCloud took ages. I had to kill a few subscriptions that didn’t work outside my Mac devices, like Hulu (maybe I needed to log into it using Apple credentials, I don’t know). You need iTunes to do this and to dive into its bowels, so I had to log back in to iTunes using my work computer to do it. Make sure you do this before getting rid of your Apple devices! Airpods work, but not as seamlessly. Holy smokes, these nearly sold me on the Apple ecosystem alone. They’re amazing! They pair so effortlessly with Apple devices and it’s nice that you don’t have to separately authenticate them with each device. It’s just not quite as clean with the Pixelbook. Still works, though. Still learning the keyboard shortcuts after months! I keep forgetting. Might be because I am still switching between my Pixelbook and Macbook for work (not to mention my external keyboard to a Chromebook at work too). The only app that can import photos as raw images from my Sony camera (which is a 2016 model, and it’s 2018) is Lightroom Mobile. I can’t run full Lightroom on my Chromebook. The Lightroom Mobile experience is fine for what it is, but highly limited, and slower than a full version at exporting to JPG. I have found some amazing apps that do all I want, including Pixlr (photo editing) and Polarr (raw photo production, like Lightroom). They’re pretty amazing and ‘do the job’ but the flow is unnatural and Polarr doesn’t support raw photos from my camera anyway. It might from yours. I haven’t used video apps. But the general consensus is that the web-based ones aren’t as good as applications, which are very few on the Chromebook. I really liked my 15 inch monitor on my Macbook Pro. Or at least the option of having one! Yes, this 12 inch one will be fine when I go on the road, but every time I open up that giant, hi-res 15 inch screen on my work computer I think… ahh. Finally, I can get stuff done. I’m a strong believer in hardware getting out of the way so we can get things done. I don’t want to spend time fiddling with controls on any new machine (camera, laptop, motorcycle, fitness equipment); I want to get after it. This is why Linux never stuck for me. I always ended up fiddling. With the Pixelbook, there was a learning curve but the question for me was: Will I get to a point where it’ll be transparent? And yes, I got to that point. And the funny thing is… now Macbooks seem difficult to use in comparison. I remember the same anxiety about switching to Macs when I got myself a Mac as my first work-only computer. That was in a conservative workplace where I had to use Excel, which at the time sorely lagged behind the Excel available on Windows. But I got used to the Mac’s version of Excel at the time, and life went on. Now, two months later, whenever I open a Macbook, I immediately find it awkward, not able to do things that have become fast for me on the Pixelbook. So there’s my answer. The Pixelbook feels like home. I am staying with the Pixelbook for now… maybe until a better Chromebook comes out. Got a niggling question that might help you decide to either stay or switch? Happy to help either way! If you're new to using Ghost, these are the first five things you should modify in the default theme to make it your own. Why I think Ghost 2.0 is far better than Medium as a host for your blog - personal or professional. If you are comparing Ghost to Medium I'm here to say you need to pick Ghost.